Anyhoo! Ready for another fun cookie recipe? I changed up (Shocker, right? I rarely stay true to a recipe.) Skinnytaste's snickerdoodles are pretty similar to a normal sugar cookie recipe, which is usually what I do anyway. 3 tbsp sugar to 1 tbsp cinnamon - I make a ton of this and keep it in an airtight container since I use it so much during this part of the year. Line your cookie sheet with non-stick foil or give it a coat of cooking spray. 1. Cream butter and 1 cup sugar. Add egg vanilla, milk, and syrup. 2. Add dry ingredients and mix until combined. 3. Chill about 10-15 minutes then roll into small balls - about 1 inch. I used the smallest cookie scoop I had and 1/2 the dough. I made about 50 cookies doing this. Want some easier options? Keep reading! 1. 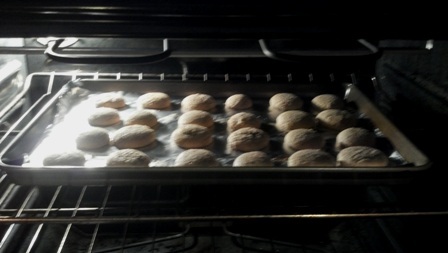 Take your fav sugar cookie recipe and add in a teaspoon of ground cinnamon.